A ribboned browband (see photo of Tisca above) can add the finishing touch to a horse's "look", drawing attention to a horse with a pretty head, and can also colour co-ordinate your own outfit. Although the basic browband is very simple to make, buying a professionally made show browband with side rosettes can set you back up to $100. Although the instructions below won't produce a browband of that quality, the result is effective and easy to learn. Although these browbands are normally edged with rosettes (like the ones I made in the photo above), they can also be left plain, or with brass or silver plated discs on either side. Two contrasting coloured lengths of ribbon . The length depends on the width of the ribbon and the size of the browband. Never use ribbon that is wider then the browbands, but ribbons the same width, or thinner (which produces more triangles) both work well. When using ribbon approx. 15mm wide you will need around 1.5 metres of each colour (which will leave a small amount left over)for a horse sized browband. You can use either satin or velvet ribbon. A browband! You don't need top quality leather, as you won't be seeing it. You can buy cheap browbands for less then $4. 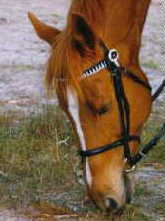 The diagrams below show a blue and white browband. The shade of blue changes a lot (oops!) just ignore it, it's only one ribbon. I will refer to the blue ribbon and the white ribbon to make the instructions clearer. Join the two lengths of ribbon together with either glue, tape or stitch them together. Lay the join beneath the browband, on the far left hand side. (the dotted lines in the diagram show what's going on beneath the browband). The blue ribbon is pointing down, and the white ribbon up. Secure it too the browband with tape, which is easier to remove then glue if you want to change the ribbons when they get dirty. Taking the white ribbon, diagonally lay it across the browband, as shown. Taking the blue ribbon, diagonally over lap it partly over the white ribbon on top of the browband, so that the edge of the blue ribbon is exactly against the edge of the white ribbon where it winds around the top of the browband. (not very well explained - see diagram. It has to be right on the edge so that you get pointy triangles, not ones with flat tops). Holding firmly onto the blue ribbon with one hand, so the whole thing doesn't slip and unravel, fold the white ribbon back over the blue ribbon, so that the other side of the ribbon is now facing up. Wind the blue ribbon around the browband, directly beside the folded back white ribbon, as close to it as you can. (so there is no browband showing at all). The blue ribbon is now pointing upwards. Fold the white ribbon back to where it was, although now it is laying on top of the blue ribbon. This diagram (on left) really shows two steps, first folding back the blue ribbon, as you did in Step Three, and then winding the white ribbon across the browband as you did in Step Four. Hopefully by now you have caught onto the pattern, and know that the next step is to fold back the blue ribbon over the white ribbon. Continue the pattern - folding alternate colours back, winding the other colour around etc, until you have completed the brow band. Secure the browband with tape or glue at the back of the browband, and you're done!! The above instructions were written by myself (Leah Clapton) and I also made the diagrams using Photo Finish. Please do not take either from this site, although you're welcome to print the instructions out of course!! The following are basic guidelines to as what to wear at a normal small show or gymkhana. In top turnout events and big shows, the standard of presentation becomes much higher with the correct turnout being very precise. As I only compete at local shows, I can not help with this sort of detailed outfitting, but I can help you with the basics. At lower levels, the type of dress for everything pretty much from showjumping to dressage is very similar, although there are some slight differences. If you are competing in an event with Pony Club Rules then you must where your correct uniform (including badge, cream/fawn jods, tie, pony club jumper and Australian Standard helmet) if you are a pony club member. 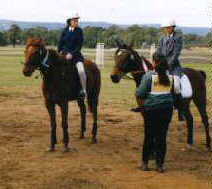 If you are competing in an EFA (Equestrian Federation of Australia) event, pony club uniform is often not appropriate and a jacket is required instead. In very hot weather officials will often announce that jackets are not compulsory, but otherwise they are needed. The two riders on the right are correctly turned out for a small showjumping gymkhana. 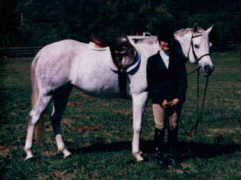 The rider on the left is under 17, and therefore wears low jodpher boots. She is also wearing joddy clips, which are specially made pieces of brown or black elastic which clip onto either side of the jodpher and go beneath the boot. These are seen at all levels of competition, and prevent your jodphers from riding up. The rider on the right is over 17, and therefore wears long boots. Long boots need not be leather at lower levels, as long as you keep your synthetic boots clean (there is a product called 'Boot and Gear Shine' which is fantastic) and unscratched they look fine. Both riders are wearing cream or fawn coloured jodphers, which are definitely the most popular colours. In the hack ring banana coloured jodphers are becoming very popular, and in dressage adult riders may wear white jodphers or breeches. Jacket colours range from the very popular navy blue pinstripe, to shades of dark green, brown, grey and black. Children (under 17) should not wear black jackets. The newest fashion in jackets are the shorter waisted, double vented jacket, that look to me very similar to the American jackets. Both riders here are wearing the single vented jackets and either style is fine. You should wear a white or other pale coloured shirt (although everyone I know wears white or cream) and a tie that compliments your jacket. Mine's maroon, Sarah's (in the photo) is navy. It's really up to you. You can have a plain tie, or a one with a subtle pattern, like dots. In hacking many riders wear waistcoats, which are essential for turnout classes, but these aren't really necessary otherwise. Gloves are a personal choice - wear them if you want. I wear black gloves, but you can also wear cream coloured crocheted-type ones or pretty much whatever you want. But beware that light coloured gloves draw attention to your hands, so if your hands aren't the best part of your riding style, wear darker gloves. For hacking and dressage most riders use the black velvet hunt caps, with the chin strap tucked up under the helmet. These helmets aren't approved, and so if you're at all worried wear an approved helmet. There are some nice approved velvet covered helmets coming you can buy. For showjumping, eventing and pony club events (including dressage at PC rules ODEs) you must wear an approved helmet. You can cover these in a coloured silk if you want, but most people just leave them white. Make sure your hair is neat before going anywhere near the show ring! Nothing looks worse hair blowing all over the place. If you are a junior rider a single plait or pig tails can looks sweet and is very fashionable in the show ring when tied with brightly coloured ribbons. Otherwise you can twist your hair into a bun and then stuff everything into a hair net. There is a special way showies do their hair, I think the split a pony tail into two and wrap each half around their heads, pinning it in place, and putting on a hair net, so when they put their helmet on they have their hair showing neatly over their ears. As far as make up and jewellery goes, keep it simple sweetie! Remember, the judge is judging the horse not how nice you look. Don't wear earrings or large rings, and make sure any make up is subtle. The photo above shows a rider correctly turned out for a hunter-jumper event. As I am not American, I can not help with the details but there is an excellent, informative section on both hunter-jumper and western attire at Horse-country.com here . Not only must you be looking your best in your clothing, your horse's tack must be clean and well fitted. Clean all of your gear the day before the show, or earlier if you have special show gear that you won't be using the day before. If you do use a different saddle or bridle, use it a few times before the show to make sure your horse is used to it. At lower levels, an all purpose saddle, whether it is synthetic or leather is perfectly acceptable in most disciplines. Although a dressage saddle is preferable for hacking and dressage, you won't be marked down for not having one, except possibly in turnout competitions. Try to make sure that your saddle and bridle are the same colour (if possible) as well. There are a few ways I clean my saddle. If it's a show saddle that is still clean from last show, as it hasn't been used since, then I'll just wipe over it with a damp sponge, making sure all the Ds and metal bits are clean. If it is dirty, however, I normally take my saddle outside, take off the mounts, and spray with the hose. To really clean off dirt (normally just thoroughly spraying the saddle does the job) I use dissolved Pure Soap Flakes and a sponge and work up a slight lather before rinsing it off. If you're like me and have left cleaning you're saddle to the last minute the night before and don't want to venture outside in the dark (!) you can stick your saddle under the shower and this works almost as well. However, if you really soak the saddle it will take a while to dry, and so make sure you leave enough time. Also don't dry it using direct heat (like sticking it in front of a heater or in very bright sunlight) as this can damage the saddle. I clean my synthetic girth by soaking it in the bathroom sink, then hanging it up in the shower to drip dry. Cleaning synthetic 'leathers', just requires wiping with a sponge, and scrub out stirrup treds or at least clean with a sponge. You can make stirrups really shine by using 'Brasso' or 'Silvo' and lots of elbow grease!! Sorry this took so long to be written up. Cait wrote an article, but I've deleted it somehow - oops! So, I'll explain the way that I clean my leather saddle, which I've owned for only a month or so. For a normal clean, simply clean the saddle using glycerine saddle soap and a small piece of sponge dipped in water. Lather gently, and then use a clean damp sponge to wipe off. For a great shine and to keep the leather in great condition, use a dressing, creme or balsam, like Effax Leather Balsam, which you just wipe on and buff to shine. For a more thorough clean, when the saddle needs oil, clean first using glycerine saddle soap or just warm water (don't use one of the 'leave on' soaps as this seals the leather from the oil) and then brush on the oil (I use Effax Leder-Soft - I love Effax!). When the oil has soaked in feed it with a creme or similar, as normal. Sit down somewhere where you have laid out lots of newspaper. Disassemble your bridle, making sure you know which hole all the buckles should be on. Clean your bit under the sink, and if it is squeaky you can use vegetable oil to oil it. Lay the bridle out to your left, and taking one section at a time, clean it with saddle soap. You do this by dampening a cloth in one of the bowls (make sure you know which one) and then rubbing some saddle soap onto it. Work up a slight gentle lather on the leather, but don't over do it as you can damage the bridle. Clean both sides, and place each section to your right as you clean it, leaving the saddle soap on for the moment. When you've applied saddle soap to all the pieces, take the other cloth and using the clean bowl of water, dampen it and wipe the saddle soap off each section, making sure no soap is left in the buckle holes. This is when you oil your bridle if you're going to do so. I only oil my bridle three or four times a year, it is unnecessary to do it every time you clean your bridle, and it is possible to 'over-oil', so don't over do it. Using either your finger or a brush, brush the oil over the leather pieces, mostly on the 'rough' side, as it will take ages to absorb on the smooth side. Wait until it is all absorbed, or when it obviously won't absorb anymore before cleaning the bridle with saddle soap as before to seal it in. (see why I don't oil or the time!?). Alternatively use a creme or balsam to seal in the oil. If the oil is absorbed instantly the bridle is too dry and you may want to do a few more coats. So now you have a clean bridle, that has either been cleaned, oiled , then cleaned again; or just cleaned once. Dressing the bridle with a Leather Dressing gives the bridle a shine, and protects it. I have used a dressing made by Hydrophane which I just brush on and leave on, and now I use Effax Leather Balsam (wipe on) which is fantastic. Different shows require a different style of saddle blanket. For hacking a shaped sheepskin or synthetic sheepskin numnah (like the one in the photo of the synthetic saddle above) is needed. For dressage square-shaped white saddle blankets are used, and for showjumping pretty much anything goes. To clean one of these use Woolwash or soap flakes, or some other cleaner that isn't too harsh and may irritate your horse. I use a clothes brush to brush off excess hair before I wash it (so that my Dad doesn't scream at me for covering the inside of the washing machine with horse hair) and then after it is washed, as some of the 'imbedded' hairs will be a lot looser. If you can't get all the hairs off, a neat trick is to fold some masking tape with the sticky side outwards, and then just press it lightly against the saddle pad. This pulls off quite a lot of hair.